It was a blessing to witness this year's conferral of the Sacrament of Confirmation by his Excellency, the Most Reverend Myron Cotta, Auxiliary Bishop of the Diocese of Sacramento, to a large number of Confirmandi (50 in all!) at the St. Stephen the First Martyr parish, an apostolate of the Priestly Fraternity of St. Peter (FSSP) at Sacramento, CA last March 13, 2016. Assisting the Bishop were Rev. John Lyons, FSSP, Rev. Lee Perry, and Rev. Zachary Akers, FSSP. The Rite of Confirmation was followed by the Benediction of the Most Blessed Sacrament, and concluded with a lively reception at the church gym. 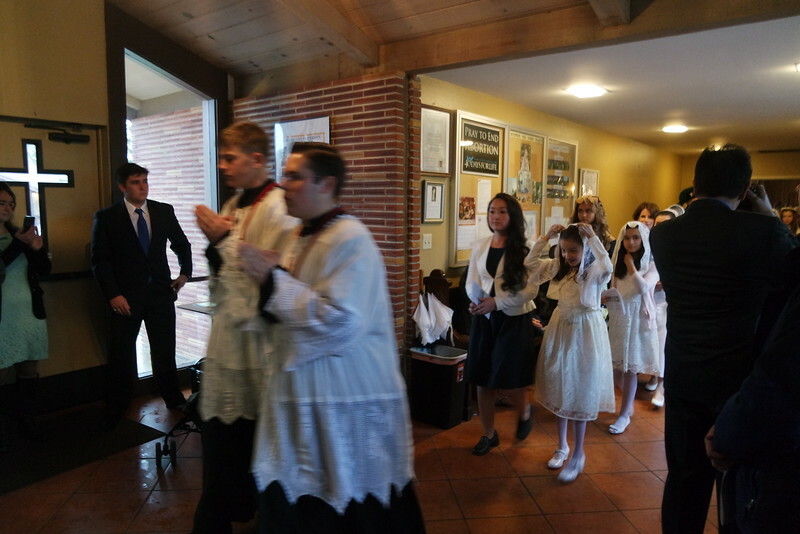 Here are photos taken by the Traditional Latin Mass Society of San Francisco. While any of our photos and videos may be freely posted on other blogs and websites, we are only requesting an acknowledgement / credit to be given to the Traditional Latin Mass Society of San Francisco with a link to our website http://sanctatrinitasunusdeus.com).